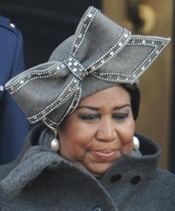 MAY 10--The Michigan milliner who created the hat worn by Aretha Franklin to President Barack Obama's inauguration has filed a federal lawsuit against competitors for knocking off the distinctive design. In a U.S. District Court complaint filed Friday, Luke Song claims that his 'lavish and ornate' creation 'gained instantaneous fame and notoriety, attracting much more media attention than even Aretha Franklin's performance itself' at the January 2009 ceremony. In the wake of the grey hat's stirring debut, Song alleges, the item has been improperly copied and sold by several firms with which he had previously done business.